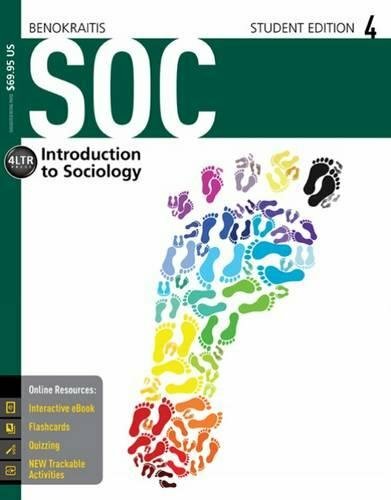 Created by the continuous feedback of a "student-tested, faculty-approved" process, SOC4 delivers all the key terms and all of the core concepts for the introductory sociology course through a visually appealing print component with tear-out review cards for students and class prep cards for instructors. Additionally, SOC4 includes an online study center offering with CourseMate that includes an eBook and set of interactive digital tools to address multiple-learning styles, all at a value-based price. SOC4 was developed with considerable input from focus groups, surveys, and conversations with students and instructors resulting in high-interest and comprehensive content, current examples, and a personal tone that accommodates sociology students' lifestyles and is proven to increase retention and enhance outcomes.